My next entry in the origami flowers section is the development of a flower which I shall call the Passion Flower because of the emphasis on radiating stamens. This grew out of the Fragrant Flower of earlier postings. I began experimenting with the fawn and green example. It has eight petals with alternating colors. Some of the most beautiful of Passion Flowers have alternating petals. The model was folded while I a finger of my left hand in a splint so it is a little sloppy. At the time I was more concerned with the question of whether the idea was going to work than I was with how well I was folding the model. It is presented "as is" and I hope no-one will be rude enough to use it as an example of my folding prowess. Instead of a separate petal connector, each petal is slotted into the side of its neighbor. It changes the look of the flower quite dramatically. Since the Passion Flower has ten petals I created the pink version. After this I progressed to the bi-color example which is made from sheets of paper with a different color on each side. There is a very limited range of double color papers in folding weight. How I wish the card weight tone-plus-darker-tone range was available in a text weight paper. The purple/orange combination seemed to be the best choice at the time but the flower has turned out rather darker than I would have liked. It is not difficult to fold but it helps to have a good supply of cushioned hair pins to hold the pieces together while folding. These additional creases in the inner petals (the ones that are not mirrored on the other side of the diagonal) help to more sharply define and separate the inner petals from their sheaths. They also help to pull the stamen parts together more firmly. The result is a crisper looking flower. This flower worked well until I tried to connect it to another one. The first examples fell apart too easily, looked ugly, were excessively complicated or pushed the petals apart in a way which spoiled the overall effect. I finally found a sturdy and good looking connection. It requires a "male" and "female" petal - one on one flower and the other on its adjoining flower. The connection has one drawback: it cannot be accomplished between the petals of finished flowers. Each connecting petal (every alternate one of the ten) has to be connected to a neighbor before being put together with the rest of the petals in its flower head. 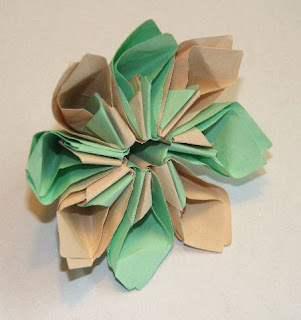 Rather than undoing the completed flowers and refolding them I have decided to make new flowers. This time I will alternate the purple-orange double petals with single petals of a contrasting color. I am waiting for a roll of lilac/white craft paper to coordinate with the slighlty garish color-scheme of my precut paper. By the way, I am using 5-1/2" squares for this model. 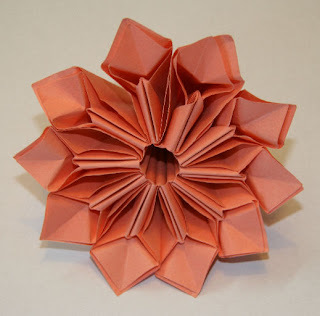 The flowers end up 4" wide and should make a reasonably sized kusudama when 12 of them are connected. The unattached alternate petals should poke out to fill in the small gap between these 12 petal flowers. 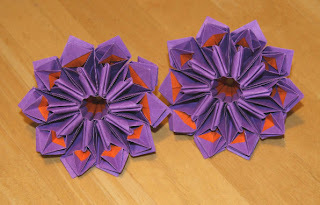 In the next posting I will upload CPs for the male and female connecting petals together with pictures of the kusudama as it is put together. As usual, I am folding/designing more than one model at a time. Much to my disgust, I STILL haven't completed the last section of the display quality Tier Box I started waaaaayyy back in these postings.